Summary: This article discusses the new cloud hybrid search service application. Use this article to configure cloud hybrid search in your organization and learn what you need to know. In the past, Microsoft has attempted to provide hybrid search scenarios between your on-premises SharePoint environment and SharePoint Online. These solutions were based on query federation. For instance, when you searched for a document in SharePoint Online in your on-premises environment, the query would be sent to the on-premises environment, and the results are returned back to the user in SharePoint Online. Microsoft released a script to automate this: http://blogs.msdn.com/b/spses/archive/2015/11/17/office-365-sharepoint-hybrid-configuration-wizard.aspx. 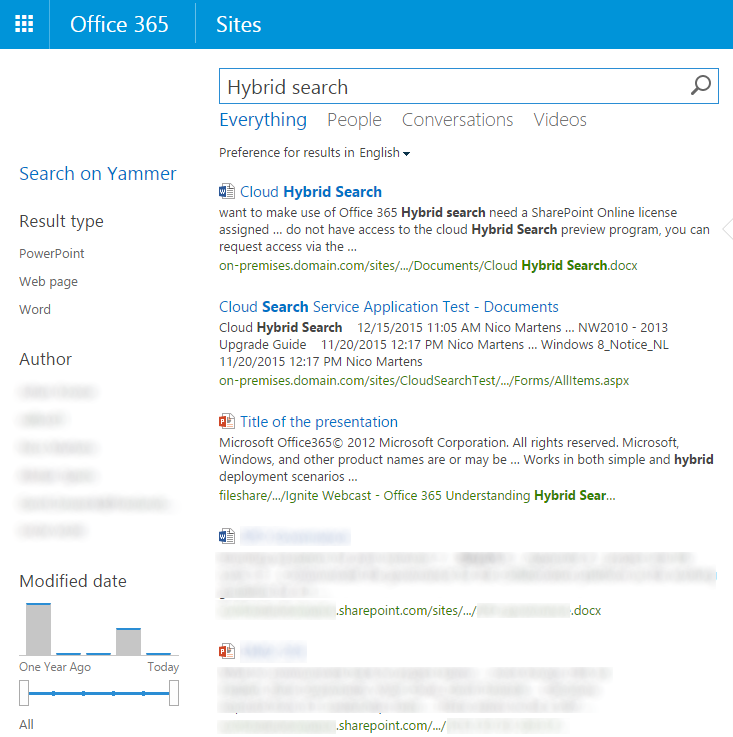 In September 2015, Microsoft released the new cloud hybrid search service application. Instead of using query federation to surface results in your environment, it relies on indexing your on-premises content in Office 365. This takes away a lot of complexity setting it up, and makes it possible to mix results from SharePoint on-premises and Office 365 in a single result block. You can set up this new feature using SharePoint 2013 or SharePoint 2016. Figure 1 shows a representation of the “old” hybrid search architecture and figure 2 shows the “new” hybrid search architecture. In this old scenario, the user enters a query in the on-premises search center. 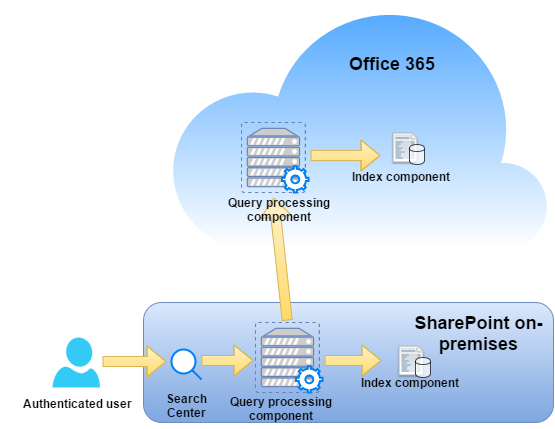 SharePoint sends the query to the on-premises query component and the SharePoint Online query component. Results cannot be interleaved out-of-the-box in this scenario, as there are separated indexes for SharePoint on-premises and SharePoint Online. However, there are several third-party solutions available that make it possible. 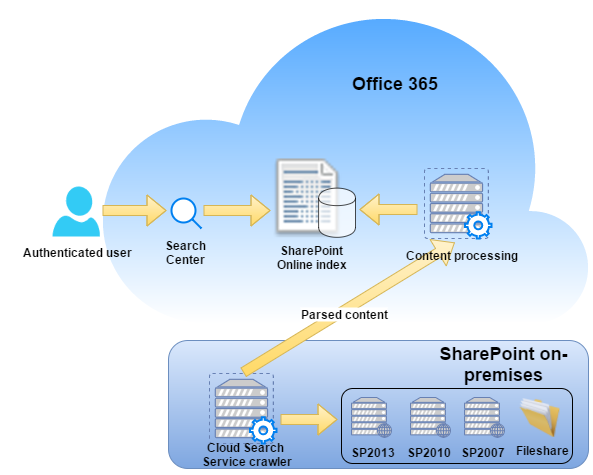 In this scenario, the cloud search service crawls the content sources on-premises and sends the parsed content to the SharePoint Online content processing component. After processing the content and doing ACL mapping – for security trimming purposes – the data is saved in the SharePoint Online index. Because the index is saved online, it is now possible to interleave results in your search results and use the data in Delve. 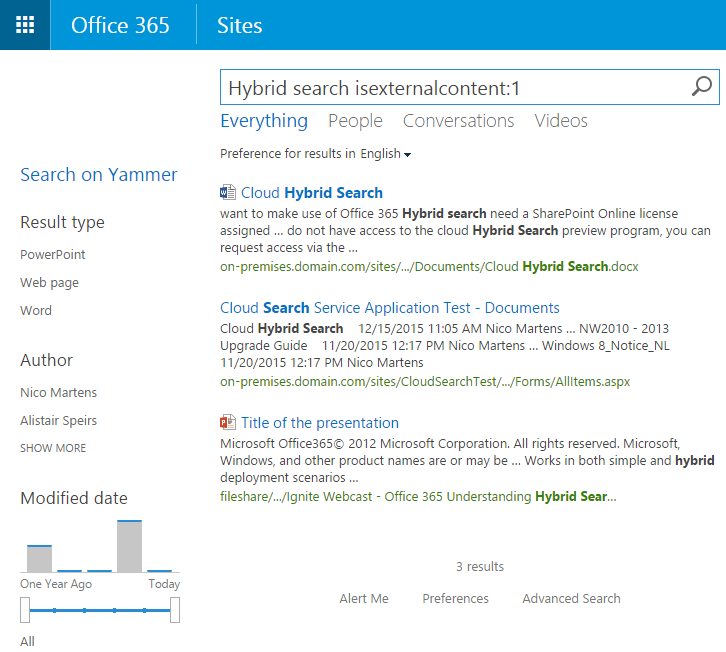 Please note that the new cloud hybrid search is still in preview, so things might change along the way! Not all companies are ready to make the move to the cloud for all their workloads. In order to help customers make the move for specific workloads, Microsoft now provides an easy way to gradually move to the cloud while maintaining a great search experience for end users. The index for all these sources is indexed in Office 365, which gives Microsoft the ability to interleave results across sources based on relevancy, use the Office 365 ranking model and even include all of this in Delve! Organizations can also scale down search infrastructure as content processing and analytics are handled by Office 365. In order to use the new Hybrid search functionality, make sure you have installed the following prerequisites for your environment. If you use SharePoint 2013, make sure you installed the August 2015 CU or later. I recommend the latest CU without known regressions, as there have been improvements to the hybrid search. Public preview of SharePoint 2016 IT Preview. The cloud search service application is currently not available for customers outside the regular Office 365 multitenant service, including China data center customers and Government cloud customers. Accounts need to be synchronized to Office 365 in order to have a single identity for users. All users that want to make use of Office 365 hybrid search need a SharePoint Online license assigned. If you do not have any of the above synchronization tools deployed in your environment, I recommend using AADConnect. It also has the possibility to configure ADFS for you, so you can enjoy the full Single-sign on experience. On the SharePoint server where you are performing the configuration of hybrid search, you will need to install the following prerequisite software in this specific order. The onboarding script will create the trust between your on-premises SharePoint environment and Office 365. You can download the script along with documentation from the Microsoft Connect Site if you’re a member of the preview program. 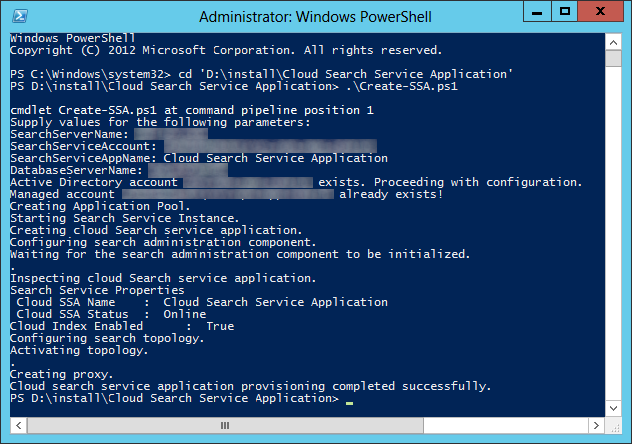 If you do not have access to the cloud hybrid search preview program, you can request access via the link http://connect.microsoft.com/office/SelfNomination.aspx?ProgramID=8647&pageType=1. Make sure you are using the latest version prior to execution. After you have installed all the prerequisites, it’s now time to create the cloud search service application, which is pretty straightforward. You could use any script that you prefer; just add the parameter, “CloudIndex $true” to the New-SPEnterpriseSearchServiceApplication cmdlet. On the server that is running SharePoint Server 2013 or SharePoint Server 2016 Preview, copy the sample script below and save it as CreateCloudSSA.ps1 and run it. This will create a single-server Search Service Application topology. If you want a highly available search service infrastructure, you have to manually adjust the script to your needs. Write-Output "Active Directory account $Account exists. Proceeding with configuration"
## Validate whether the supplied SearchServiceAccount is a managed account. If not make it one. Write-Output "Managed account $SearchServiceAccount already exists!" Write-Output "Managed account does not exists - creating it"
Write-Output "Unable to create managed account for $SearchServiceAccount. Please validate user and domain details"
Write-Output "Starting Search Service Instance"
Write-Output "Creating Cloud Search Service Application"
Write-Output "Waiting for the admin component to be initialized"
Write-Output "Inspecting Cloud Search Service Application"
Write-Output "Setting IsHybrid Property to 1"
Write-Output " Cloud hybrid search service application provisioning completed successfully." Write-Output "Account supplied for Search Service does not exist in Active Directory." Write-Output "Script is quitting. Please create the account and run again." The output should look similar to figure 3. Place this anywhere between your <configuration> and </configuration> tag. To make it easier to find when you need it, you could place it right before the </configuration> tag. After successfully installing the prerequisites and configuring the cloud search service application, it is time to start the onboarding process. The onboarding process will create a trust between your SharePoint on-premises and Office 365 environment. This will allow SharePoint to move the index to Office 365 for further processing. 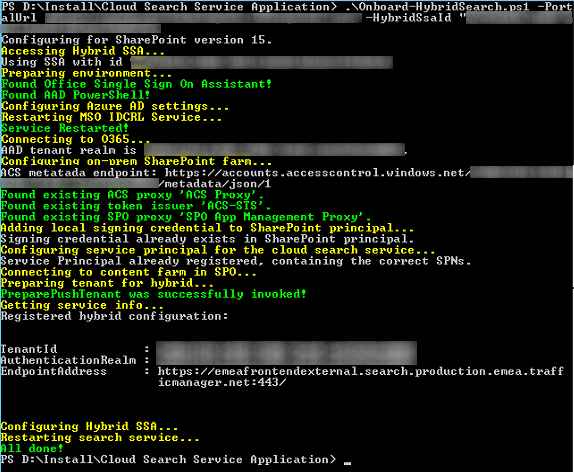 .\Onboard-CloudHybridSearch.ps1 -PortalUrl "https://yourtenant.sharepoint.com" -CloudSSAId "<Cloud Search Service Application name>"
Enter your Global Administrator credentials when prompted. Figure 4 shows what your output should resemble. The script changes quite frequently. The script name and the parameters have changed a bit since I ran the script. Make sure you check to see what the correct parameters are when you run the script. You can configure the content source in your new cloud search service application as you would in any other on-premises SharePoint environment. As Figure 5 shows, you configure the content source of the cloud search service application in Search Administration. 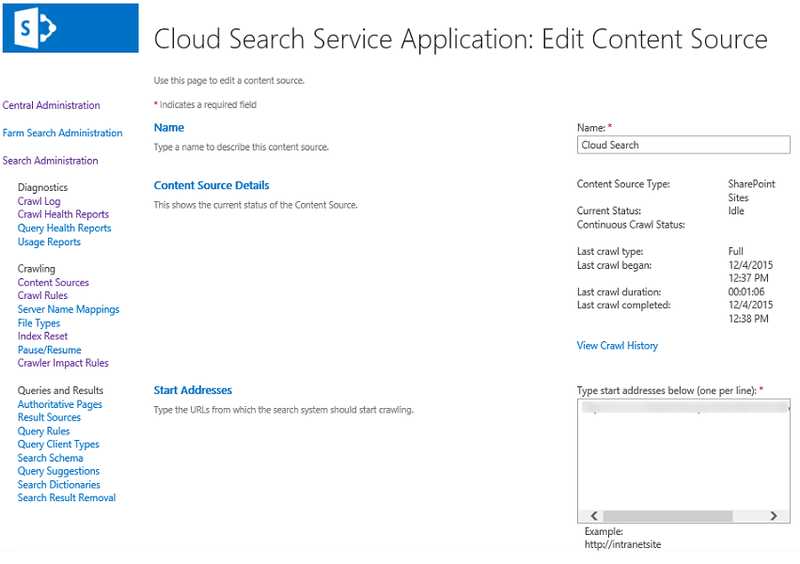 Figure 5: In SharePoint Search Administration you can edit (configure) the content source for the cloud search service application. Enter the start addresses that you would like to crawl and start a full crawl for the content source. After the crawl is done, check the crawl log for the specific content source to see if all went well. Make sure to check your proxy configuration (http://sharepointrelated.com/2015/12/11/cloud-hybrid-search-proxy-settings/). In Office 365, search for a document and it will return results for both SharePoint Online and SharePoint on-premises if cloud hybrid search is configured correctly. If you want to return results only from your on-premises site, you can use the “isexternalcontent:1” property. As figure 8 shows, this returns only on-premises results. Figure 8: Using the isexternalcontent:1 property shows search results only from on-premises. I hope this helps you use the new hybrid cloud search service application. * All figures in this article were taken in a client’s test environment, with approval. This entry was posted in Cloud Hybrid Search, Office 365, SharePoint 2013 and tagged Cloud Search Service Application, Hybrid, Office365, Search by Nico Martens. Bookmark the permalink.